I used to have the hardest time finding gifts for all the two-year olds in my life--until I found LeapFrog's My Pal Violet. I have a 2-year old god-daughter whose birthday is this month, and for the past few weeks I was doing a lot of fretting and hand-wringing over what to get her. I wasn't worried about her so much as her mother, who can be sort of critical with gifts sometimes. Not to mention the fact that this little girl has just about every toy you can imagine. I went to the store thinking I was going to just settle for something that was just okay. 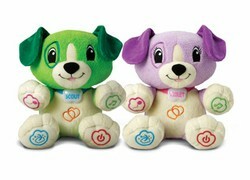 After scouring most of the store, however, I found LeapFrog's My Pal Scout and My Pal Violet. I pressed Violet's paw and she said "Take me home with you and I'll learn your name and favorite songs." I couldn't put her down after that. I just kept pressing her paw and she came up with comment after comment, and song after song. My boyfriend thought I was insane! So I bought Violet for Olivia (my god-daughter). Connect to the computer (with an included USB cable) and personalize the dog with the child's name, favorite food, animal, color. Choose the child's favorite songs for Violet or Scout to play from a bank of 30 songs. Violet and Scout will play games and sing lullabies to the child. Once you have personalized them they will teach the child how to spell his or her name and will use it frequently. My Pals are for kids ages 6 to 36 months. It's sturdy and soft, so it can take any throwing around and biting that may occur with a child at such a young age. It's no wonder that this toy is a bestseller and award winner. Coming in under $30 almost anyone can afford it and it will provide hours of fun for the lucky little kid in your life. Click the pictures of Violet and Scout below to find the best prices for each. When I gave this toy to Liv, I pressed its paw. Livvy started dancing right away. I took it out of the box for her and she took it to her picnic table, put it down, pressed its paw, and started dancing again. When the song was done she picked up Violet, hugged her, and started running around the house with her. She kept doing that over and over again. I had to leave 45 minutes ater and she was still playing with her! I have never in my life seen anyone of any age so happy with a present I've given them. My Pal Violet was the best $25 I've ever spent, and they next time I need a gift for a two year old you better believe I'll buy her or My Pal Scout. Not only are they both inexpensive, but both are educational and fun for the little cutie pies.